1. Our heirs. These would be any individuals chosen to receive a portion of the estate. By default this usually means family members but friends of the family are often named in wills as recipients of assets. 2. Charities. These would include churches, ministries or other non-profit organizations focused on a particular need. Gifts to charities are common at death because a) in life the person felt drawn to that charity’s mission and b) gifts to charities are deductible from a person’s estate, thus reducing the possible tax burden. 3. The government. This will happen through the estate tax if the total value of the estate exceeds the tax threshold set by the government. It may seem like an obvious statement but we can only decide who gets our inheritance before we die. If we wait and die without a will that spells out our desires, the court system will decide for us. That’s a huge risk because the court may end up deciding not to leave the estate to the ones you would desire most, which usually is family – specifically the children. Do My Kids Automatically Deserve the Inheritance? 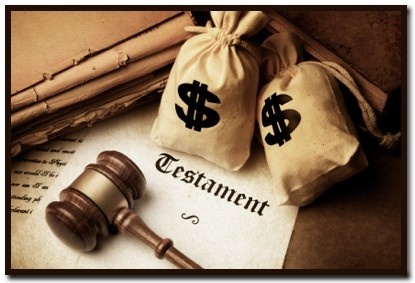 The practice of leaving an inheritance to one’s children has been occurring since ancient times. It is ingrained into our modern thinking. There is an assumption that the next generation should automatically receive something when their adult parents pass away. Children (especially grown children) begin to develop an expectation for what will be left to them as their parents age. In many cases the contents of the will have not been revealed to them, they just assume that because they are blood kin some portion of the estate will be left to them. “It’s expected…I deserve it because I’m family” so the thinking goes. This thinking doesn’t only develop from the bottom up – kid to parent. It filters the other direction also – parent to kid. Adult parents may feel the obligation to “reward” or “thank” their children for taking care of them in their old age. “What better way to thank them than naming them in my will.” The pressure to do this could be enhanced the more involved the children become in taking care of the aging parents. In addition, adult parents may want their financial legacy to live on through their kids. They see the passing of wealth as setting the next generation or two up for financial success. In this way parents see what they are doing as a blessing, so the kids may be able to enjoy some pleasures possibly not afforded to them based on their current circumstances. While those are nice sentiments, assuming wealth should be automatically passed to the next generation is dangerous. It neglects some fundamental issues to consider. In 100 percent of circumstances parents should attempt to leave assets for their children who have not reached adulthood. In the event of an untimely death, children will need money set aside for their care at least until they graduate from high school, perhaps even through college age. This money should be managed by their caretaker (or a trust) with explicit instructions on how to use it. To fail in this responsibility to provide for young children is negligent and irresponsible. The age issue becomes cloudier as the children grow older. Parents become more detached from their children as they grow and the children become more financially independent. So they may not feel an obligation to leave their children money. In addition, adult children in their 60’s and 70’s may not have the same financial needs as a 16-year old. The money from an estate may be better served going in another direction. Related to age is the concept of need. Do the children actually need the money? As I already mentioned, grown adult children who have been working and investing for 30-40 years may have accumulated vast amounts of wealth already. Someone in their 20s has not had that opportunity yet and could benefit more from receiving an inheritance. Another issue to consider in regards to need relates to families with multiple children. The question to ask here is “Does one child need it more than another?” The neurosurgeon pulling in $600,000 per year would typically be in much less financial need than the school teacher making only $30,000 per year. That could get sticky of course with one child feeling they are being treated unfairly. Communicate ahead of time to avoid misunderstandings, jealousy and hurt feelings. 1. What debt levels do my children have? 2. Are there medical issues that are causing a financial hardship for a child or grandchild? 3. Does my child have a large or small family to take care of? Parents may feel uneasy dividing an inheritance unequally based on need – like they are expressing more affection for a specific child when this happens. It’s important to remember however that dividing an inheritance unequally doesn’t reflect on a parent’s love for their children. A child’s emotional and spiritual maturity should be huge considerations in the inheritance discussion for this reason: Will you be funding your child’s dysfunction by giving them an inheritance? If the child demonstrates consistency in these behaviors with no desire to change, giving them an inheritance would almost certainly exacerbate the problem. 1. What is the best (or worst) thing that can happen if I transfer wealth to (fill in the blank)? 3. How likely is it to occur? That exercise should bring the clarity needed to either calm one’s nerves or raise alarms towards the recipients of the inheritance. A final consideration in regards to children should be their relationship to other siblings. How tight is the family unit? What are the children’s emotions towards one another? Have there been instances of competitiveness, jealousies or sibling rivalry that have led to broken relationships? Will the money enhance an already felt closeness or serve to drive siblings further apart? Are there blended family relationships and issues to consider? My wife and I have gone back and forth on this issue about leaving an inheritance for our children. Certainly we have always sought to provide a means for their care should we pass away before they reach adulthood. But what to do after that has been confusing. 3. It would ensure our family’s financial legacy filtered into the next generations. Seems straightforward enough. Leave what you can for your children so that it even impacts the grand kids generation. The context of the verse implies that practice as a good thing. So I (we) got to thinking that perhaps simply building an inheritance to distribute all the money when we die isn’t the end-all of growing wealth. Maybe there is more value in teaching financial literacy, building family togetherness, imparting personal values and teaching spiritual lessons in the present. Those things would be more valuable of an inheritance than any amount of money that could be left upon our death. What good would leaving money be if those left behind didn’t have the wisdom to manage and use it wisely? We are now set on a dual path which involves building wealth to leave some for our kids, while at the same time using some of that wealth in the present to facilitate the aforementioned goals in the last paragraph. Some ways this practically works out now would be for us to spend money on things like private school education, family vacations, summer camps and participation in sports and other extracurricular activities. Those all cost money that could be saved, invested in the stock market and ultimately grow to be an inheritance. However, we firmly believe that using some of the inheritance money now to impact their lives has far more value than if we left it until after we are gone. So they won’t receive as much later as they could if we scrimped and saved all the way to our death. But hopefully they will receive something in the present that will impact them for the rest of their life. And the best part is my wife and I will get to see that impact while we are still alive. Like many decisions regarding personal finance, only you can answer and solve this question. You know your family best – their depth of maturity, their needs and struggles. Factor all these considerations into the equation when deciding the inheritance issue. The giving-wealth-to-the-kids decision is only one issue to resolve. There are many other factors and questions that go into setting up an inheritance. I’ll continue discussing those in my next post as I tackle “Inheritance Week” here at Luke1428. Questions: Do you think children automatically deserve to receive something – no matter how small – as an inheritance? What’s your view on wealth accumulation – should you accumulate as much as possible to be given away at death? Have you seen an instance where an inheritance wrecked a child’s life? It seems to me that with the baby-boomers generation has come the selfish idea that there’s no need to leave an inheritance to one’s children, but that one should either leave it all to charities or spend it all down on themselves. Biblically, planning to leave an inheritance was understood to be a final act of love for the future well being of one’s offspring and it was an accepted tradition. I think it’s very generous of you to want to help your grandkids JJ. If you are looking to leave some money for them in your will, you can specify what that money is to be used for. In fact, you can set up accounts for them now for such things – like an educational savings account to be used only for educational purposes. Or you can specify they only can receive the money when they reach a certain age, (i.e. 21, 25, 30, etc.). I’d consult an attorney and/or a financial planner to help you with these matters. What a bout a child who is a believer, yet justifies marrying a Muslim. The inheritance could be used for anti-Christian purposes. Should the child get an inheritance at all? That would be a tough situation Kristine. My instinct, and what I will tell my children one day, is that if I have any inkling that the inheritance would be used to advance destructive behaviors, then I’m not giving them one. In my mind, an inheritance has to be earned through appropriate actions that are consistent with what I believe about faith and money. ..my son has recently married a muslim and already has purchased a house for his other half’s family in Indonesia…..sad change of events….I am anti muslim totally….now 70 years plus will never advance him any more $$$ help ever…..a line has been Drawn….!!! If an adult child(40 year old, makes $200k a year) only calls the parent or sees the parent, twice a year, and shows no interest in the parent, then the adult child will understand why they did not get the two million dollar inheritance from the parent that went instead to the church family. I think this is a very interesting topic, and I like the argument that providing an inheritance (or the expectation that one will be provided) may even prove to be a negative thing: for some people, knowing that they’re going to be wealthy when their parents die, may reduce their incentive to work and strive to achieve something in their own right. “…may reduce their incentive to work…” Exactly! That’s why as a parent you have to monitor your child’s behavior and spending patterns even into their adulthood. Like I said in the post I don’t want to be funding their dysfunction. Such an interesting and thought provoking post. We don’t have kids yet, but when we do I hope we’ll be able to leave them an inheritance (if of course they are “good kids” who have grown into productive adults). I don’t believe that you “have” to leave an inheritance to your children, especially if they aren’t going to be able to use it in a healthy way (like you said if they have a drug or gambling problem, that’s a different story). The answer is “of course”. As a father, should I pass away, I’d like to leave something to my children to secure their brighter future! The hard work I do is mainly for them. The love of a father it is. Great post, Brian. Lots of food for thought and it something where there really isn’t a wrong or right answer – just the one that works for you. Unfortunately, a lot of people don’t like thinking about this and like almost everything, it’s better to put into place what you want to happen now. It can get very messy otherwise! It is our plan to leave an inheritance to the girls and select organizations. I definitely don’t think kids should expect to receive an inheritance because even if that is the parents intent, it still may not happen. People can use up all their assets from just living longer than expected, lack of planning or long-term care expenses. I also agree that we, as parents, need to not only consider any type of financial inheritance we give our kids (which is what most parents think about) but equally if not more importantly, consider the personal legacy we leave behind in what we teach our kids – from financial literacy to just being good people. “…zero student loan debt.” I think that’s a great gift Kathy! Best part is you will be able to see the benefits of that decision while you are still alive. Ahhh, so many families end up fractured over inheritances, challenging wills and whatnot. It’s very sad. I like that you have had multiple conversations and thought about this from many angles. I think a lot will come down to how your kids mature over time, as to how you choose to leave your money. “…kids mature over time…” This is a big deal and you are right to point it out Anne. Honestly, if my kids mess their lives up once they leave the house and don’t live responsibly (in their relationships and with their finances), I’ll seriously consider cutting back on giving them anything. They would just squander it. I wouldn’t mind leaving something behind for my kids. The world is becoming a hardened, more difficult place and I would like to die knowing that I helped them take care of their own families. With that being said, leaving an inheritance is not a huge priority for me. I’d rate the necessity to leave an inheritance on the very low end of financial goals. Debt, retirement, college, savings, giving (while alive) all take precedence in my book. Well I am not worried about the receiving end of an inheritance, I don’t think either side will leave much of anything to fight over. But when the wife and I do have kids, and actually some wealth, this is an important topic. Do you leave anything? If so, how much? Right now the vast majority of our wealth is set to be received by our kids as they have years before reaching adulthood. I’d say 85-90% for their future care. The other 10-15% is designated for charities. I certainly don’t think children should expect or automatically get an inheritance. This is going to prove how redneck I am, but I actually had two cousins get in a fist fight at the funeral over what meager inheritance their mother left. She left it all to one daughter and none to the other. So while I think, it’s OK to leave out a child who is not responsible or who would use the money in irresponsible ways, I think the mother should have left them some indication that this was her plan, and not left it all to play out after the fact, or maybe that was her plan? I kind of think it would be great to help your kids as they need it if they are trying and are responsible. Like giving them the money for a down payment on a home or for buying a business. It might do more good as they are trying to get established instead of later in life. Of course, I assume we will live to a ripe old age. As far as receiving an inheritance from my parents, I have mixed feelings. I have no idea what they might have or how long they will live, but I’m not sure I would want to take money that way as I’m pretty independent and want to make it on my own. If I inherited money tomorrow, I’d probably give it to their favorite charity, but that’s just me. Hopefully, I have many more years before that’s an issue. Actually that’s not true, I’d put some of it in my daughter’s college fund. For me this all goes back to something Andrew Carnegie said (which I should have put in the post), “Surplus wealth is a sacred trust which its possessor is bound to administer in his lifetime for the good of the community.” And I’d like to add administer “at his death” in that equation as well. If good can come by passing on an inheritance to family then great. If not, it goes to others. I’d gladly receive it if one was passed to me, then figure out how to best maximize its use for my family and others. I worked with high net worth individuals at my last job. Wealth transfer to the next generation while simultaneously minimizing their tax bills was a huge priority. It was really fascinating. If there’s one thing I learned, it’s that whatever we choose to do with our wealth (I would like to think we could give our children something) you need to plan plan and plan. Get organized, make the tough decisions about what you want for the future and get an attorney to help with the paperwork. The last thing I want to do is leave my children with a messy estate and money to fight over. “…plan plan and plan.” I agree 100% Liz. When thinking about planning, I’m often reminded of a great proverb from the Bible which says, “Where there is no vision the people perish.” That could certainly happen to a family unit if the inheritance is passed on sloppily. I have gotten around this problem entirely. Not only do I have no children to leave things to, I’ve nothing to leave even if I did have kids. Perhaps I can solve both problems in the years I have left. I agree that inheritance is more than money! And I think, I would definitely leave an inheritance for my daughter, but I want to make sure that she is financially responsible. At her early age, she is now seven years old, I already teach her how to value the money. I’d feel very comfortable leaving money to someone I knew was financially responsible. That’s my role as a parent to pass that value on to my kids and encourage them to pass it on to their kids. Whatever I’m able to accumulate, I want it to be used for the good of my family and others long after I’m gone. So many great questions to ask yourself in this post. This is one area where there really is no one-size fits all approach. Every family is different. Personally, I would love to leave something behind for my future children. I wouldn’t want them to have access to it until their 40s though. Hopefully I will have taught them to live financially sound lives by then and they can use it to pursue a passion or make a positive lifestyle change that they wouldn’t have been able to afford without it. Well my situation is different as I have no children, but I do not think children should expect an inheritance. If it happens it happens, but one should not set up their life thinking it could happen. “…have no children…” Good point! That’s something I didn’t address here but the distribution of assets post-death should still be on the single person’s or the couple with no kids radar. Like you said, it depends on the child’s age, but if they are already on their own and you taught them well, they won’t need an inheritance. It would help, but they won’t need it. I think the best thing to do is to keep updating your will and/or trust as your kids age. Aldo recently posted…How Much Money Do I Need To Retire? “…updating your will…” That really is a crucial point. Doing it once and forgetting about it won’t cut it. We review ours probably every three years, unless there is a major life changing event in between. This is an interesting post–thank you. Since we don’t have kids yet, I’m not really sure what my personal position will be. I am thankful to my parents, however, for letting my siblings and me know of their plans in advance. Mostly, I am grateful that my parents have already drawn up their will in explicit detail because I think it’s important to know what their exact wishes are. I do hate talking about it with them, though, because I hate to think of them passing away. I hope it’s many years before I need to read their will! “…parents have already drawn up their will…” That really is great news. Such a large portion of people die without a will…makes it very confusing for those sorting through the pieces. I don’t expect to receive any money from either side. Definitely not from my parents as they don’t have much financially. Inheritance has caused grief on both sides of the family (mom &dad). Sibling jealousy etc. There usually is someone who thinks they deserve more than the other. Truth is we don’t deserve anything. Whatever is passed on to us should be viewed as a blessing not an entitlement. Great post! Yep, you nailed it, inheritance is more than money. What good is it to leave money if people don’t know how to manage it. They will spend it all and end up in a worse spot. Doesn’t mean you can’t leave money, but the education on how to use, spend, save, invest money will be more worthwhile to someone than the money left to them. I had very rich grandparents and they left us all nothing other than life lessons of hard work and knowing the value of a dollar (well and he left me a $5,000 suit – which I am scared to wear, seriously who spends $5,000 on a suit). It’s been interesting to see other family be extremely upset as if they deserve things automatically in life and be upset instead of just taking what they were taught and earning things on their own. I likely won’t be as wealthy as my grandparents but they have set me up for life with what they taught me. Sounds like a great legacy you’ve been left Lance. And yes…that is a pricey suit. I’d think of selling it (despite the sentimental value) if I wasn’t going to wear it. Live the life you want, hope that you have some left to leave. If you do, great, but don’t deny yourself your life so that you automatically have to. Money Beagle recently posted…Are Cheeseburgers Worth As Much As Babies? As a financial planner, it is interesting for me to see different parent’s responses to this question. I have some who say they plan to spend everything and leave nothing for the kids and I have others who spend nothing on themselves, hoping to leave more for their children. For us, we would like to leave something for our son, but we definitely have it allocated in direct relation to his age. We also plan to not speak of the money we are leaving for him, but rather teach him and train him to make his own way so that he would not have a need for our money. I have a number of other older clients who are relying on their parent’s deaths to support their retirement plans and I think that is just plain wrong. “We also plan to not speak of the money we are leaving for him…” I understand why you are doing that. I think that conversation is safe to have though many years down the road once he gets into adulthood and has those wise habits established that you’ve taught him. I’m just looking at it from a transparency standpoint so everyone knows what to expect once I’m gone. I think you hit the nail on the head – inheritance is more than just money. That said, I’m a fan of leaving money to children but I’d also like to consider their individual needs. And in doing that, I’d have some very open conversations about what I was doing and why – I wouldn’t want a bombshell to be revealed after my death, making things even more difficult for my kids. “I wouldn’t want a bombshell to be revealed after my death…” Right…that is no fun. That can easily impact someone emotionally for years if they feel blindsided by someone they loved. Brian recently posted…4 Sneaky Ways to Save More Money and a Giveaway! Very valuable post, Brian. I think people lack knowledge re the details of leaving an inheritance. I’ll be passing this one on! Personally, I do not think children automatically deserve an inheritance. If that’s the case, they’re not held accountable and may act entitled. But if they’re deserving, then I think they should get an inheritance if that’s an option. “…may act entitled.” That is a critical danger. I’m of the mind that an inheritance has to be earned by demonstrating wisdom with one’s own personal finances. If they show that I have no qualms about passing it on.